Generation School offers participants valuable classroom and hands-on instruction plus networking opportunities for generator operators and technicians. Whether a seasoned operator or just starting out in the field, all can benefit. This year we will offer in-plant, hands-on instruction on three different engine sets: Enterprise, Cooper and Fairbanks Morse. When registering, please indicate preference for hands-on instruction—which will take place at the DELANO Power Plant (Fairbanks Morse Engine) and at the GLENCOE Power Plant (Cooper & Enterprise). NOTE: Generation School takes place at multiple locations, beginning at the Hutchinson Fire Department. See below for details. NOTE: Participants need to select ONE of the following when registering. Participant is responsible for transportation to location. Instructors: Lester Wheeler and Rex Stormer, Exline, Inc.
On July 10, 2018, a fire broke out in the ceiling of the generation plant. That day, Delano Municipal Utilities employees showed up to work like every other day. The day went on as planned—until everything changed. In this presentation, we will cover the events and timeline. We'll talk about some of the things we knew needed to be done and some things we learned as the process unfolded. 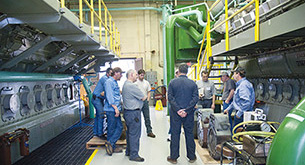 PPE required for tours and hands-on training in the plants. NOTE: Ear plugs will be provided. All fees increase $50 on March 25, 2019. Fee includes: workshop tuition, materials, refreshment breaks, bus transportation for tour on Tuesday, lunch on Wednesday and a certificate of attendance. Participants are responsible for their own transportation and lodging. Deadline to register is April 4, 2019. MMUA will issue a refund (less $30 per person) for cancellation of an advance registration, provided MMUA is notified by 4:30 pm on April 5, 2019. Sorry, no refunds issued for cancellations after April 5. MMUA has negotiated a reduced rate at Hutchinson's new Cobblestone Hotel & Suites for $105.40/night plus tax. Please call hotel directly to make reservation and ask for the "MMUA-Generation School" room block. Note: Because availability is limited and the reduced rate cannot be guaranteed, we suggest you make your reservation as early as possible! MMUA's hotel block closes on April 4 or when sold out. A printable version of the Generation School brochure is also available.